After more than a decade together and two years of marriage, Angelina Jolie and Brad Pitt are over. TMZ reported Tuesday that Angelina filed for divorce, citing “irreconcilable differences.” She has also requested for physical custody of the couple’s six children, with Brad having joint legal custody and visitation rights. While you try to digest the reality of this news, here is a look back at their unconventional Hollywood love story. Summer 2004: Brad and Angelina meet on the set of Mr. & Mrs. Smith. January 2005: Brad and Jennifer Aniston announce their separation after nearly five years of marriage. Jennifer files for divorce from Brad, citing irreconcilable differences three months later. April 2005: Rumors about Brad and Angelina’s romance reach a peak when photos of them vacationing in Kenya with Angelina’s son Maddox surface. June 2005: Brad and Angelina attend the Los Angeles premiere of Mr. & Mrs. Smith, but do not pose for red carpet photos together. July 2005: Brad and Angelina are featured in a special W magazine spread titled “Domestic Bliss.” The spread caused an uproar with fans of Brad and Jen, since they were taken in March. That same month, Angelina adopts 6-month-old Zahara from Ethiopia. 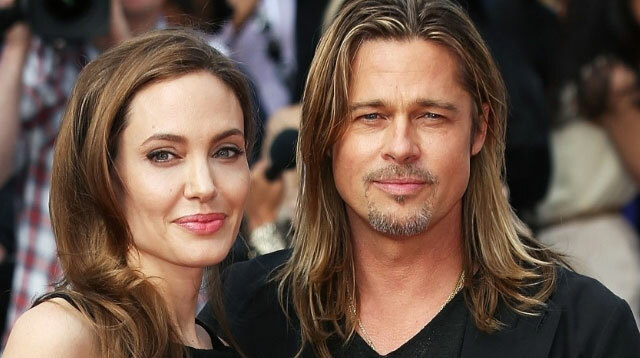 October 2005: Brad and Jennifer’s divorce is finalized in Los Angeles county court. It’s also revealed that a judge has granted the couple’s request to legally change Maddox's and Zahara’s last names to Jolie-Pitt. May 2006: Angelina gives birth to daughter Shiloh Nouvel in Namibia. The couple sells the baby’s first pictures through Getty to benefit charity. They give a press conference days later. “Our other daughter [Zahara] was born in Africa and so this is a special continent for us,” the couple said at the time. June 2006: Shiloh covers People magazine with her parents. It’s later reported that the magazine purchased the North American photo rights for a whopping $4.1 million. Hello! Purchased the British rights for $3.5 million. Proceeds from both magazines were donated to UNICEF. December 2006: Brad and Angelina finally pose together for the first time on the red carpet for the premiere of The Good Shepherd. March 2007: Angelina adopts Pax, 3, from an orphanage in Vietnam as a single parent per the country’s adoption laws against unmarried couples. Pax’s legal last name is changed to Jolie-Pitt one month later. May 2008: Angelina and Brad announce at the Cannes Film Festival that they’re expecting twins. 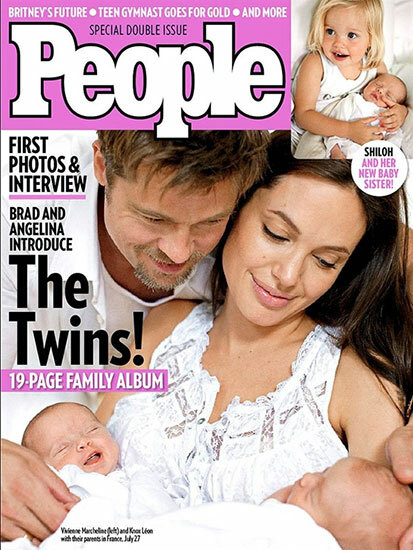 July 2008: Angelina gives birth to Knox Leon and Vivienne Marcheline in Nice, France. Photos of the babies are sold to People and Hello! again, this time for a reported $14 million, making them the most expensive celebrity photos ever taken. All proceeds from the sale are given to the Jolie-Pitt Foundation. Two-year-old Shiloh also makes the cover. October 2008: In an interview with the New York Times, Angelina reveals that Mr. & Mrs. Smith is a movie where she and Brad "fell in love." November 2008: Angelina covers W magazine with photos taken by Brad at their home in France. Angelina tells the magazine, "I do think that I'm in a good partnership now. I think it just needed to be the right man." She adds that she has "a lot of respect" for Brad: "He helps me to be better and fight hard for things that I love." Seemingly responding to Angelina's New York Times interview from October, Jennifer Aniston tells Vogue, "There was stuff printed there that was definitely from a time when I was unaware that it was happening. I felt those details were a little inappropriate to discuss ... That stuff about how she couldn't wait to get to work every day? That was really uncool." July 2010: Angelina paints an intimate portrait of her life with Brad in Parade magazine. "There's never a period when Brad and I are pulled apart. We are not separated for more than three days, ever. We stay really connected. We actually don't go out much. It's funny. We're very homebound. We're very much Mommy and Daddy in our pajamas." Brad calls Angelina “heroic” in the London Evening Standard: "Having witnessed this decision firsthand, I find Angie's choice, as well as so many others like her, absolutely heroic. I thank our medical team for their care and focus. All I want for is for her to have a long and healthy life, with myself and our children. This is a happy day for our family." In an Esquire interview, Brad discusses the joys of his family in great length. "I always thought that if I wanted to do a family, I wanted to do it big. I wanted there to be chaos in the house ... There's constant chatter in our house, whether it's giggling or screaming or crying or banging. I love it. I love it. I love it. I hate it when they're gone. I hate it. Maybe it's nice to be in a hotel room for a day — 'Oh, nice, I can finally read a paper.' But then, by the next day, I miss that cacophony, all that life." June 2013: Angelina and Brad walk the red carpet for the World War Z premiere in London. The premiere marks Angie’s first red carpet since announcing her double mastectomy. August 2014: Brad and Angelina marry at their French estate Chateau Miraval in Correns. 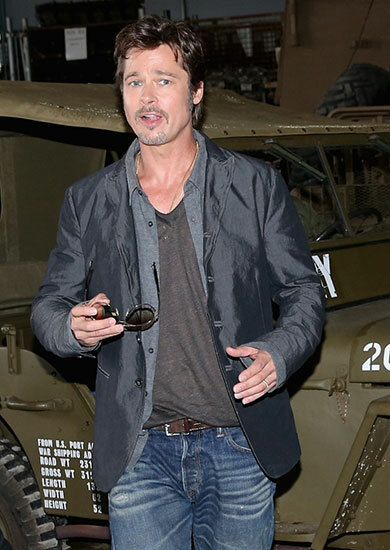 Brad's wedding ring makes its debut at the Fury photo-call in England. September 2014: Angelina’s wedding dress, partially designed by her kids, is revealed on the cover of Hello! November 2014: Brad and Angelina spend part of their honeymoon in Malta filming their second project together, By the Sea, which is also directed by Angelina. They make their first red carpet appearance as a married couple at the premiere of Unbroken. Later in the month, Angelina and Brad attend the premiere of By the Sea at the AFI Fest in Hollywood. It would be their final red carpet appearance as a couple. September 2016: Angelina files for divorce from Brad, just weeks after their second wedding anniversary. TMZ reports that Angelina is not asking for spousal support and in her divorce papers, lists the date of separation as Sept. 15, 2016. CNBC has obtained a statement from Angelina via her attorney: "This decision was made for the health of the family. She will not be commenting, and asks that the family be given its privacy at this time." Brad also also issued his own statement to People: "I am very saddened by this, but what matters most now is the well being of our kids. I kindly ask the press to give them the space they deserve during this challenging time."